Add a 2nd internal hard drive or SSD to your unibody MacBook Pro or unibody MacBook with the MCE OptiBay®. The MCE OptiBay replaces the internal SuperDrive (DVD drive) of your MacBook Pro 13", 15" or 17" Unibody or MacBook 13" Unibody with a high performance SATA hard drive or SSD providing up to 2TB of additional internal data storage! The MCE OptiBay is a precision-crafted enclosure which houses a high performance 2.5" SATA Hard Drive or SSD and directly replaces the SuperDrive (DVD Drive) in your machine. It is designed to the exact same physical specifications and screw hole locations as the original internal SuperDrive it is replacing. This allows it to be installed precisely in the same location as the SuperDrive and to be fastened properly to your MacBook Pro or MacBook using the same screws and mounting holes used by the original SuperDrive. The OptiBay, unlike other poorly-designed or cost-cutting solutions whose designs are quite unlike the original SuperDrive and may dangerously deviate the circulation of air inside the MacBook Pro from its originally intended path over critical components, maintains the same air-flow profile and characteristics inside the machine due to its size and shape being identical to the original SuperDrive it replaces. Compatible with all Mac OS (Including High Sierra, Mac OS 10.13) and Windows operating systems. In order to maintain functionality of your SuperDrive, we are offering our new MCE USB 2.0 Enclosure for Unibody SuperDrive for just $20.00 with the purchase of an OptiBay! 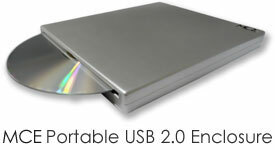 Easily install your Unibody SuperDrive into our ultra-slim, ultra-portable, specially designed USB 2.0 Enclosure and use with iTunes, iDVD, Finder Burning, etc. just as you did before! The enclosure is completely portable and powers from your USB ports and installing your Unibody SuperDrive into it is a breeze! You can also choose to include our ready-made Portable 8x USB 2.0 Double-Layer SuperDrive with your OptiBay Hard Drive. This slim external SuperDrive provides you with a bootable, portable, bus-powered drive that is just as compatible with iTunes, iDVD and Finder Burning as before.1 You can use it to load system software, install applications, as well as play and burn DVD's and CD's. Use the drive only when YOU need it... and put it away when you don't! You can also choose the MCE Desktop 24x DVD-/+R/RW USB 2.0 / eSATA "SuperDrive" if you would like the convenience of a higher-speed double-layer CD/DVD reader/writer at your disposal in a more stationary desktop form factor. Included with every OptiBay is the MCE OptiBay Utlity program. This is software we created specifically for OptiBay users and allows them greater flexibility when using their, now external, SuperDrive (DVD Drive) that was removed when installing the OptiBay, or any other external DVD Drive. The MCE OptiBay Utility program activates the Apple DVD Player application so that it can now play movie DVDs from an external SuperDrive when there is no internal SuperDrive in the system. As well, if you ever reinstall your SuperDrive back into your machine our OptiBay Utility program will allow the Apple DVD Player application to again play movie DVDs from the internal SuperDrive. The OptiBay utility program is compatible with Mac OS 10.4 through the recently released Mac OS 10.13 (High Sierra). It also provides other functionality when using the OptiBay and this is fully detailed in the program and accompanying Read Me file. *The MCE OptiBay for Unibody is compatible with all unibody MacBook Pros and unibody MacBooks (except the MacBook Pro with Retina display). Use this guide to compare the Model Identifier of your machine with those listed below. Finding your Mac's Model Identifier is easy: Simply hold down the Option key on your keyboard and click on the Apple icon at the upper left of your screen. Now select the first item there which will be either "System Information..." (Mac OS 10.7 - 10.13) or "System Profiler..." (Mac OS 10.6 or earlier). The next window that appears will display your Model Identifier near the top. **If you have an early or late 2011 MacBook Pro, MacBookPro 8,1, MacBookPro 8,2, or MacBookPro8,3 and you are considering installing a SATA-III (6 Gigabit, 6 Gbps) device (SSD, Hybrid Drive, or Hard Drive) in the optical bay, using the OptiBay then please see our new OptiBay Extreme. MCE OptiBay Utility Software - Allows you to continue to use Apple DVD Player app to playback commercial DVD movies from the external USB SuperDrive. and Daily Giz Wiz Show #917. "4 out of 5 Stars!" You may install this upgrade yourself (an installation guide and the proper tools are included with the drive) or, if you are not comfortable with working on your laptop, you may have the product professionally installed into your computer by MCE Technologies or one of our worldwide Authorized Upgrade Centers.